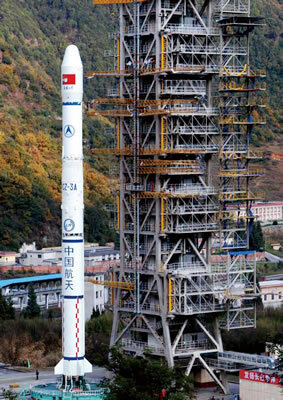 The development of LM-3A launch vehicle was started in 1980s on the basis of LM-3 fight proven technology and other heritages of Long March launch vehicles. In February 1994, its maiden fight was successfully performed. LM-3A is a 3-stage launch vehicle developed on the basis of LM-3 and LM- 2C. Its third stage is powered by cryogenic propellants --- liquid hydrogen and liquid oxygen. It is mainly usec for launching spacecraft with GTO mission. Its launch capability for GTO mission is 2,600 kg. The fairing static envelope is 3m in diameter.